Looking good there Mito, its nice to start work on the scenery. Marcus' Spring. The rocks are broken plaster covered by a layer of runny plaster brushed on. Looking towards Withy. I found a packet of cement colourant and added some to cellulose filler. I put too much in so it looks like well chocolate! The rocks on the right were made from a home made mold using plaster of Paris. More chocolate. The light colour is fine sawdust stuck down with wood glue. I don't know how successful it will be. Tomorrow will tell. I intend to paint it then sprinkle ground cover over it. An experiment. Looking North out of Withy Jct, towards the spring. For more realism I will then drybrush some white acyrilic paint on the top of the waves. Thanks for the info about making streams. I shall do something similar. The reason for Marcus' Spring is in memory of my elder son who was killed as a passenger in a car accident some 15 years ago. It's as my pseudo-name here. In memory of the most loyal dog I have ever had. He was poisoned by a "hunter" but was saved by our vet but had to be put down 2 years later with advanced leukemia caused by the poisoning. It keeps them alive in my mind. Thanks for the update and explanation, Brian. VERY sorry indeed to read about your son and dog. On a (MUCH) lighter note, at least you tried the sawdust. A bit more progress, now with a bit of colour. It's impossible to see the spring. I have to hold the camera over the layout. The rocks are plaster on which I've used watercolours as the plaster absorbs the paint and it's easier to blend in different colours. the tint I used in the cellulose filler was for cement based products. It's worked but can be rubbed off so a coat of acrylic paint seals it. The bridge is made. I have to make the bridge supports and it will be put in when the painting is finished. Excellent progress, Brian. You're now definitely ahead of me and likely to get even further ahead as I won't have any major free time until the Christmas holidays. That's all looking very good indeed Brian. Excellent progress and I'm looking forward to more photos. You're well ahead of me now, Brian, with your scenery and it is all looking very realistic. I look forward to further progress. A short rake of single and double (LWB) timber wagons has, finally, arrived at Cant Cove for repainting: half in BR Late Bauxite and half in the new "Castle Estates" blue livery but there will be a delay before work can commence. Once completed they will join the rake of wagons and vans (minus the "Sam's Cider" van as you already have one to represent 'through' workings) stored at Cant Cove awaiting onward shipment to Somerset. I see you have one of the pre-BR wooden bodied horseboxes but in an unusual grey livery) so racehorse specials between Somerset and North & West Cornwall be a possibility. A Lima horsebox in BR Crimson and Satin Black will also be on its way when I have time to repaint the recent arrivals. Thans to John all the Lima horseboxes have had new, better looking wheelsets fitted. I have 3 horse boxes bought years ago. I can paint them to match yours. The one you can see is dark olive in colour.What colour do you use to paint Sam's Cider wagons? I'd like to paint a couple more to satisfy demand from the South East. I have 3 horse boxes bought years ago. I can paint them to match yours. The one you can see is dark olive in colour. 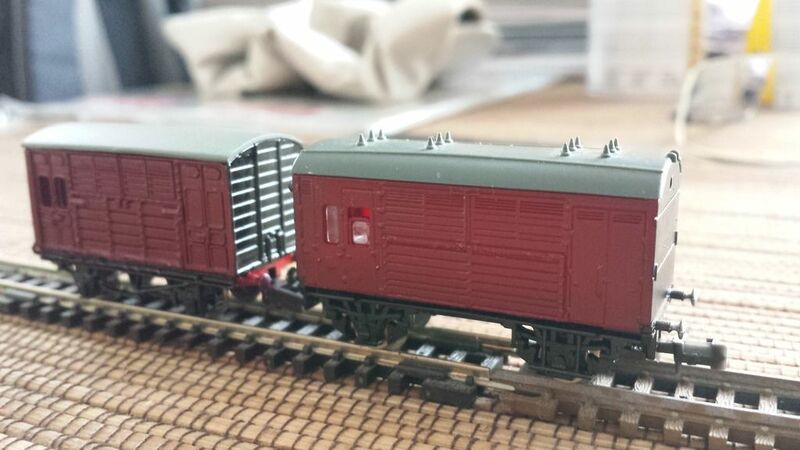 What colour do you use to paint "Sam's Cider" wagons? I'd like to paint a couple more to satisfy demand from the South East. 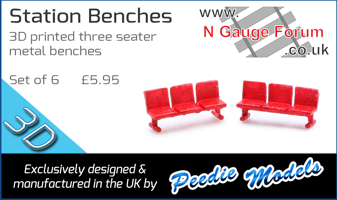 The Graham Farish pre-BR wooden bodied horseboxes are painted BR Crimson (a car spraypaint: Ford burgundy red) with satin black (Humbrol enamel) ends and internal glazing (transparent plastic sheet) added. As I'm going to paint another batch in the holidays I could do your three, too? 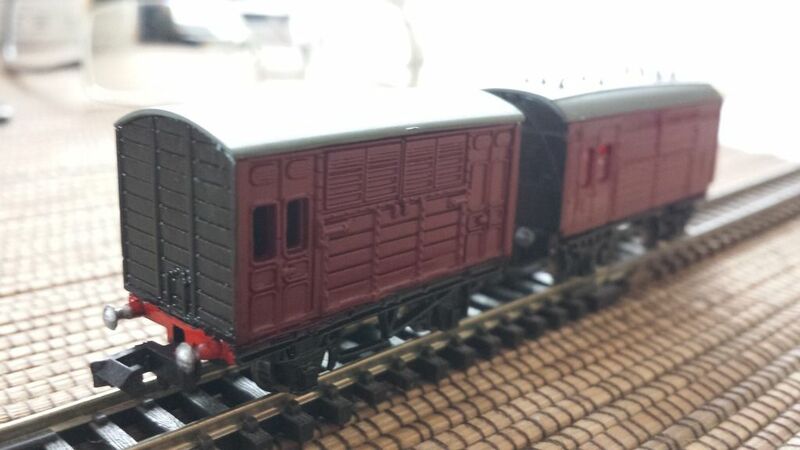 The "Sam's Cider" vans and wagons are painted Humbrol enamel Gloss 2. I'm happy to paint more in the holidays. 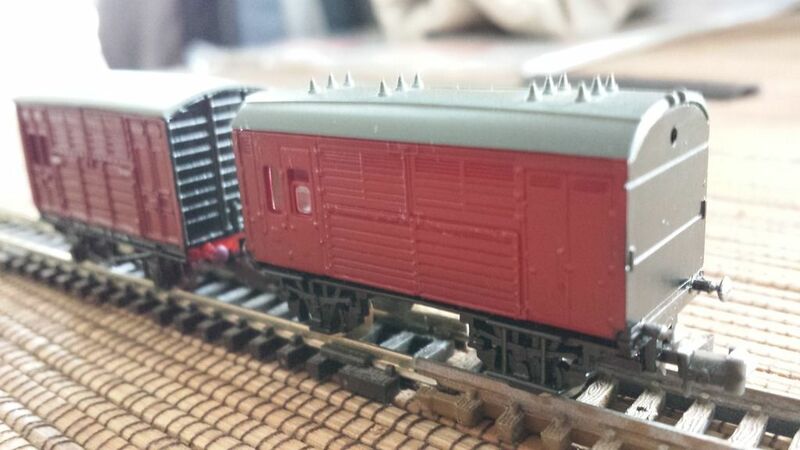 I have since exchanged the Lima one's wheels for slimmer profile GF coach ones and fitted glazing inside the GF one after painting the interior matt dark grey to reduce the translucence of the maroon plastic body (it was bought as a LMS one), and repainted the buffers at one end of the GF one. Once the interior of the Lima horse box had been completed the circular holes on the ends were filled with Tamiya Filler then, once it had dried, sanded and the ends repainted in satin black. The Lima horse box has also had the body put on the right way since the photos. were taken so that the steps are at the correct end! Finally, suitable transfers still need to be added. However, I only have XP ones in yellow. Are there any transfer sheets available for non-BR Standard horse boxes? An up date on Marcus' Spring. Not a good photo I'm afraid. I need to gloss the river add some trees and it should be just about finished. The road on the right is 1000 grit wet and dry still to be toned down. The track is covered with masking tape as I want to give the foliage a coating of hair spray tomorrow. Papier machée covering mosquito netting for the hill and polyurethane foam for the other contours. I came across a couple of boxes of Woodland Scenics Sculptamold which must be about 20 years old. I've used a bit to see if it's still good. Tomorrow will tell. There will be a halt there, name to be decided. Very good progress, Brian. 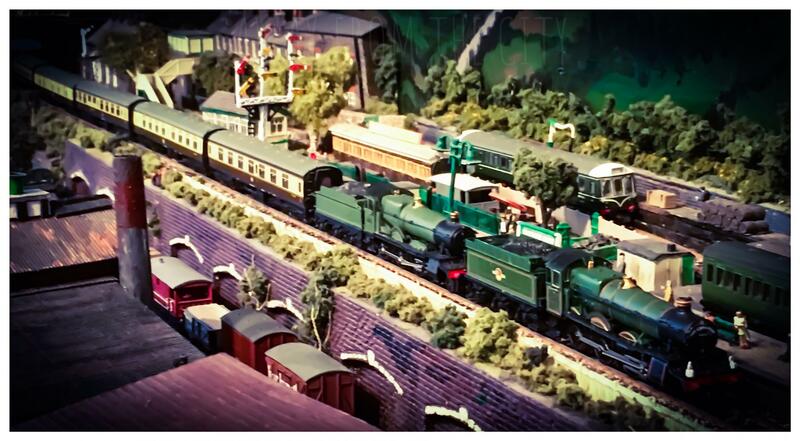 I hope that the Woodland Scenics Sculptamold is still good.